Which Service should a Post go to? I have been trying to organize/visualize the way I post, be it blogging, a comment on FriendFeed, an interesting link a came across etc. 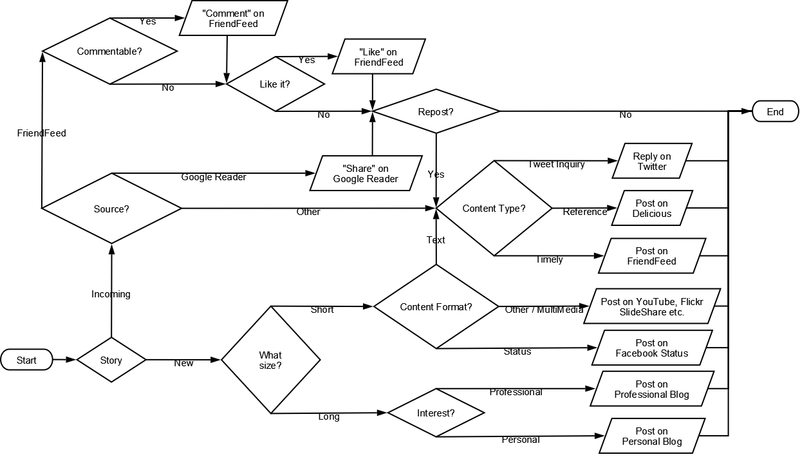 During the time it took me to complete the flowchart, more services were added as sources or carriers of my posts. As a result, the chart got more complex than originally anticipated. Interestingly enough, there is a pattern and the flowchart works for me most of the time. Please do comment. Is posting a one-way street for you? Are there any general rules or do you post on a case by case basis? 2 comments to Which Service should a Post go to?